CUDA-Z is a project I do in my spare time. 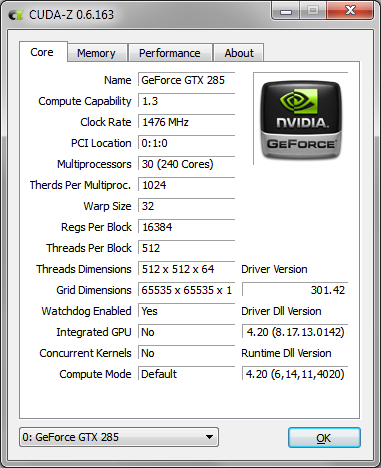 This is a simple program identical to CPU-Z and GPU-Z which shows nVidia CUDA characteristics and performance. CUDA-Z is written on Qt/C++ and uses CUDA SDK for GPU programming. Thus, the program is available for Windows, Linux and Mac OS X platforms. The software is completely charge/ad-aware free and available under terms of GPL2. Source code you can find in download locations and in official SVN repository.